The 2011 Tour de France is underway with the long first stage heading into the countryside of the Vendée after a scenic route along the coast. I support Team Sky, because they’re British and because Juan Antonio Flecha rides for them. I have a soft spot for Flecha. I’ve gathered together the essential equipment for Tour-watching: knitting, route map, Tour guide magazine, remote controls, French biscuits. Today also marks the start of the Tour de Fleece and across the world spinners and knitters in their hordes will have picked up their fibre or yarn and set off on their own competition to spin or knit their own pre-set goal (for example, spin a set amount of fibre or knit a jumper) through the duration of the Tour. 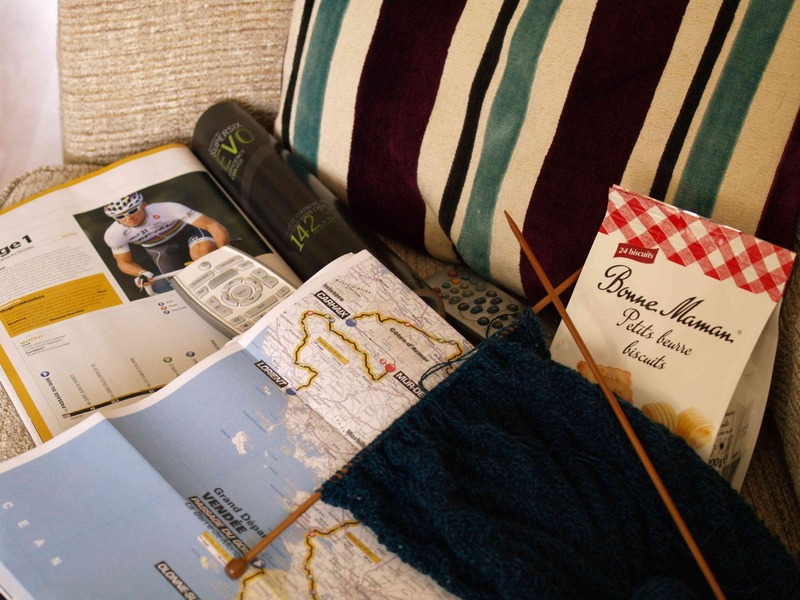 I don’t have any goals and haven’t joined any groups, I’m just not a joiner-in, but it can’t be argued that a competition like the Tour de France offers great blocks of time to sit on the settee and knit. Will the sleeve of the Slope Rib Cardigan be finished today? Will I simply grind to a halt and give in to the attractions of the French biscuits? Join us tomorrow to hear how the day went. I might well keep you updated with Flecha’s performance in the Tour too! Previous Where did my handwriting go?